The transformative power of robotics is already impacting various industries. In the U.S., the long-awaited robotics revolution has an unquestionable epicenter: Massachusetts. The state is home to some 100 robotics companies, which employ more than 3,200 people. 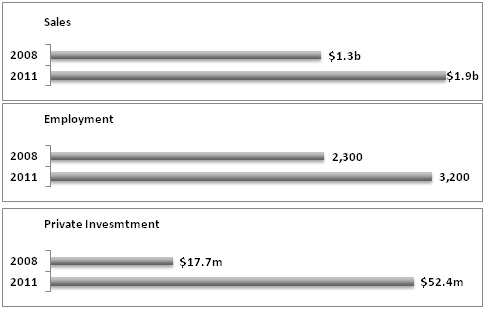 According to the Massachusetts Technology Leadership Council, the Massachusetts robotics industry reported almost $2 billion in sales and $52.4 million in private investments in 2011. The present article will discuss the comparative advantage of the Massachusetts robotics cluster, its composition, and the wave of disruptive innovation it has experienced. It will further assess the huge business potential of the state's robotics companies and the R&D tax credit opportunity available to assist them in the full realization of such potential. Long-awaited technology advancements for robots are now gaining momentum as recent developments in electronics, hardware, and components (such as sensors, motion controls, and vision systems) trigger an unprecedented wave of robotic innovation. Robots once confined to the labs have become indispensable to a wide range of operations. From industry and agriculture to healthcare and defense, robots are no longer a futuristic possibility but an ever-more common reality. A new generation of smart automated products has proved the revolutionary and disruptive power of robotics. Today, robots are not only able to automate manufacturing and warehouse logistics, but they assist in noninvasive surgeries and physical rehabilitation, perform hazardous military missions, and engage in domestics tasks such as vacuum cleaning. In other words, robots increase productiveness and competitiveness while creating new high-value jobs. Industry giants have shown unprecedented interest in the blooming field of robotics. Google acquired eight robotics companies in 2013, including American and Japanese companies that have pioneered various technologies, such as software for advanced robots arms, grasping abilities, and computer vision. Although the Internet giant has been tight-lipped about the specific plans for its growing robot collection, the scale of investment leaves no questions as to its intention of building a new class of autonomous systems. Launched in 2011, the National Robotics Initiative (NRI) seeks to accelerate the development of robots that can work cooperatively with people, extending or augmenting human capabilities. The program is supported by different federal agencies, including the National Science Foundation (NSF), the National Aeronautics and Space Administration (NASA), the National Institutes of Health (NIH), the U.S. Department of Agriculture (USDA), and the Department of Defense (DOD), through the Defense University Research Instrumentation Program. By fostering the development of the next generation of co-robots, the NRI aims at advancing specific goals and applications, such as increasing labor productivity in the manufacturing sector, assisting with dangerous and expensive missions in space, accelerating the discovery of new drugs, and improving food safety by rapidly sensing microbial contamination. The ongoing revolution creates major opportunities both for robotics companies and for related and supporting industries, which are directed impacted by robotics applications. Clustering is the phenomenon whereby firms from the same industry concentrate geographically. The interconnected businesses that compose a cluster enjoy a series of benefits usually reserved for large companies, known as economies of scale. Clusters combine a concentration of expertise and skilled workers, easy access to suppliers, and privileged channels of information, which ultimately decrease costs per unit of output. Hollywood, Wall Street, and the Silicon Valley are typical examples of U.S. clusters. However, recent years have seen the consolidation of a new vibrant cluster as the state of Massachusetts concentrates unmatched quantity of robotics companies. It is now safe to say that the state has a unique intellectual infrastructure, talent pool, entrepreneurial environment, and history of successful innovation in the field of robotics. Claiming the position of "Robotics Capital of the World", the Massachusetts Technology Leadership Council highlights five pillars of the state's competitive advantage, namely, 1) critical mass of world-class universities, 2) cutting-edge robotics research and development, 3) highly skilled workforce, 4) innovative companies producing and utilizing robotics applications, and 5) skilled supporting and related industries. Massachusetts is home to more than 100 robotics companies, 60% of which are less than 10 years old. 35 robotics research and development programs are currently underway in 10 different Massachusetts academic institutions. Between 2008 and 2013, investments in Massachusetts's robotics industry amounted to $209 million and 18 robotics start-ups were established in the state. SOURCE: Mass Technology Leadership Council, The Massachusetts Robotics Revolution, 2013, page 7. The robotics industry in Massachusetts experienced an average annual revenue growth rate of 11% between 2008 and 2011. A survey of companies showed great optimism, as 80% believed in continued growth for the near future. Massachusetts is home to some of the country's leading research institutions whose efforts in the field of robotics have fueled the industry's rapid growth. In addition to major R&D breakthroughs, such institutions also provide a world-class talent pool of highly skilled professionals. The following table, originally published by the Mass Technology Leadership Council, presents an overview of focused robotics higher education programs as well as R&D programs currently underway in Massachusetts' universities. - Hybrid & Networked Systems: specializes in networked mobile robotics. - Intelligent Mechatronics Lab: works with medical robotics, structural dynamics, and mobile robot communications. - Neuromorphics Lab: develop bio-inspired computers and robots. Focus areas include the application of neural technology to mobile robotic platforms. - Andersson Lab: specializes in the autonomous control of robots. Ongoing efforts focus on the development of sensors and actuators. - BioRobotics Research Group: activities include medical robots and instrument design, development of imaging techniques for surgical guidance, modeling of tool-tissue interaction, and tele-operation/automation of instrument motion. - Human Adaptation Lab: develops robotic exoskeletons for human rehabilitation. Brandeis' Dynamical & Evolutionary Machine Organization (DEMO) Lab has focused on automated modular design and the use of generative encodings, the autonomous evolution of dynamic gaits in legged robots, and the innovative concept of embodied revolution of robots. - Robotics Lab, Division of Engineering and Applied Sciences: specializes in micro-robotics, analog computation, choreography of dynamical systems, control of quantum systems, pattern generation, and robotic system identification. - Wyss Institute for Biologically Inspired Engineering: through the study of human biomechanics, the Institute has developed robotic tools for rehabilitation and surgical purposes as well as innovative medical devices. - Computer Science and Artificial Intelligence Laboratory (CSAIL): specializes in modular and self- reconfiguring robots, distributed algorithms and systems of self-organizing robots, networks of robots and sensors for first-responders, mobile sensor networks, animals and robots, cooperative underwater robotics, desktop robotics, and forming, moving, and navigating sparse 2D and 3D structures. - Newman Lab for Biomechanics, Mechanical Engineering Department: works on the development of physical therapy devices. - MIT Media Lab: devoted to projects that promote convergence of technology, multimedia, and design, the interdisciplinary MIT Media lab has engaged in various robotics initiatives. The Personal Robots group researches the social engagement of robots aimed at providing social and emotional support as well as assisting in education. The Mechatronics Group focuses on the merging of body and machine. Ongoing projects include device architectures that resemble the body's musculoskeletal design, actuator technologies that behave like muscle, and control methodologies that exploit principles of biological movement. The MIT Sea Grant AUV Lab works on the development and application of autonomous underwater vehicles, known as unmanned marine robots. - Marine Science Center Biomimetic Underwater Robot Program: has the objective of enabling engineered devices with the adaptive capabilities of marine animal models. Through a biomimetic approach, it has focused on the development of sensors, actuators, adaptive logic systems, and electronic nervous systems. - Biomedical Mechatronics Lab (BMl), Department of Mechanical & Industrial Engineering: specializes in rehabilitation and medical applications of robots. Studies the design, fabrication, control, and testing of novel robotic systems. Working in partnership with corporate sponsors, Olin College's students develop multi-disciplinary full-year robotics projects. Ongoing projects focus on the creation of unmanned ground, surface, and autonomous vehicles. - Neuromechanics and Biomimetic Devices Lab: Through the incorporation of biomaterials, neuromechanical controllers, and compliant microelectronics, the lab has focused on the development of "biomimetic soft-bodied robots". - Human Robot Interaction Lab: ongoing projects focus on affective control and evolution interactions between affect and cognition; cognitive robotics for human- robot interaction; embodied situated natural language interactions; among others. - Advanced Technologies Lab: focus areas include mobile robot navigation, endoscopic surgery, and educational robots. - New England Robotics Validation and Experimentation Testing Center: services robotics research programs and companies from New England. Laboratory for Perceptual Robotics: specializes in solving sensory and motor problems. Current projects include sensor networks, mobile manipulators, and integrated bimanual humanoids. UMass Dartmouth's engineering research program includes the study of advanced controls for robotics. Creator of the nation's first fully integrated Bachelor of Science degree program in Robotics Engineering, WPI also offers MS and PhD programs in robotics. Recent projects by WPI students include search and rescue robots, a rehabilitative robotic glove, and robots to improve communications skills of children with autism. Ongoing efforts include the development of autonomous underwater vehicles. The Massachusetts robotics cluster is home to a wide variety of robotics companies from different segments (for a complete list of companies, see Appendix I). The following illustration depicts the diversity of segments represented in the state. Located in a hub for innovation, Massachusetts companies have pioneered numerous commercially successful products, such as the first ground robots to support U.S. troops and the first self-service robots for hospitals. The following paragraphs will present an overview of the cluster's companies and their ongoing innovation efforts. Named one of the world's most innovative companies of 2014 by Fast Company Magazine, Bedford-based iRobot is at the heart of the Massachusetts robotics cluster. In 2008, the company generated one third of the cluster's sales. Its origin, over two decades ago, can be traced back to the MIT Artificial Intelligence Lab, demonstrating the intimate link between academic research and commercial production. IRobot designs and manufactures service robots for consumer, government, and industrial markets. As for March 2014, the company has sold more than 10 million home robots, most of them being the award-winning Roomba self-operated vacuum cleaner. Launched in 2002, Roomba pioneered the world of practical robots. 12 years later, iRobot's line of home robots includes the Scooba Floor Scrubbing Robot, the Braava Floor Mopping Robot, the Mirra Pool Cleaning Robot, and the Looj Gutter Cleaning Robot. The company has also played an important role in the fields of defense and security, delivering more than 5,000 combat-proven robots worldwide. IRobot PackBot has been used in multiple dangerous situations, including search, reconnaissance, and bomb-disposal missions. Other iRobot's military robots are the Small Unmanned Ground Vehicle, developed for the U.S. Army modernization program, the iRobot FirstLook, and the iRobot Warrior. IRobot also works on remote presence solutions. Its latest products include the AVA 500 video collaboration robot, which enables the autonomous telepresence of remote workers, and the telemedicine robot RP-VITA, which offers unlimited connection between patients and physicians. Deeply committed to innovation, iRobot invested $60 million in new technologies in 2013. The company's goal "is to drive innovation, serve as an industry catalyst and change the world by fueling the era of robots". Founded 2008 by a co-founder of iRobots, Rodney Brooks, Rethink Robotics is also a pioneer of the robotics industry. The company's Baxter Robot, an engaging low cost self-programmable robot, is gaining tremendous attention as it redefines the way robots can be used in manufacturing environments. Different from other industrial robots, Baxter is capable of sensing and adapting to its tasks and environments. It exhibits a behavior-based 'common-sense' that allows it to work safely and intelligently next to people. The robot's humanoid features - two 7-axis arms, 360degree sonar and front camera, and interchangeable end-effectors - further enhance its adaptability. Thanks to its unique low price point and to the easy programming and integration it enables, Baxter is making robotic automation solution a reality to companies that could never previously consider it. Robots, however, are not confined to manufacturing environments. Faced with the growing challenge of labor scarcity, the agricultural industry is increasingly turning towards robotics. Located in a hub for farming robotics innovation, Massachusetts companies have pioneered the world of automated harvesting solutions. 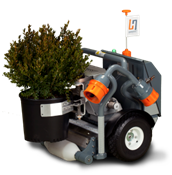 Billerica-based Harvest Automation has developed the HV-100, a small robot designed to work alongside humans in horticulture. Also known as Harvey, the robot specializes in spacing and re-spacing plant beds as well as collecting containers in smaller farming applications, like nurseries and greenhouses. It is equipped with camera sensors, can handle up to 22 lbs., and can perform 200 moves per hour, in all weathers, day or night. Likewise, Jaybridge Robotics, a Cambridge-based software company specialized in autonomous vehicle development, has partnered with KINZE Manufacturing for the development of a fully autonomous large-scale vehicle for row crop environments. The driverless grain cart system can haul up to 30 tons of material. It is capable of performing a complete workflow during the harvest process, which means locating a moving harvester, synchronizing with it, collecting its grain, and delivering them to trucks for transportation. Such a solution significantly increases productivity particularly of corn and soy growers. Recently acquired by Google, Boston Dynamics is yet another example of innovation in the Massachusetts cluster. The company has gained international reputation for advancing mobile and off-road robotics technology. Its animal kingdom-themed machines, such as the BigDog and WildCat robots, are extremely agile, capable of walking over rough terrains, climbing walls and trees, and even running faster than human beings. 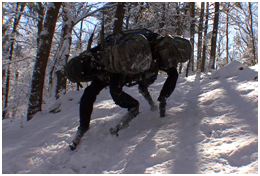 Boston Dynamics was founded in 1992 and has since worked mainly for Pentagon clients, such as the Defense Advanced Research Projects Agency (DARPA), the U.S. Army, Navy, and Marine Corps. Warehouse automation is also a blooming area for the Massachusetts robotics cluster. Wilmington-based Symbotic (formerly CasePick Systems) has been a pioneer of integrated supply network automation solutions for warehouses and distribution centers. Using innovative robotics and rack systems, the company's MatrixSelect is designed to optimize fulfillment, transportation, and logistics. Their autonomous mobile robots, called MatrixBots, can travel freely throughout the storage structure accessing any product, in any location and at any time at a very high throughput rate, delivering product in sequence to build stable, store-friendly pallets. Home to one of the nation's most vibrant clusters, Massachusetts is at the forefront of robotics innovation. Congregating more than 100 companies and 10 research institutions, the state offers a highly favorable environment for the development and commercialization of cutting-edge automation solutions. Massachusetts robotics companies should take advantage of federal R&D tax credits to further enhance their role as catalysts of the ongoing robotic revolution.